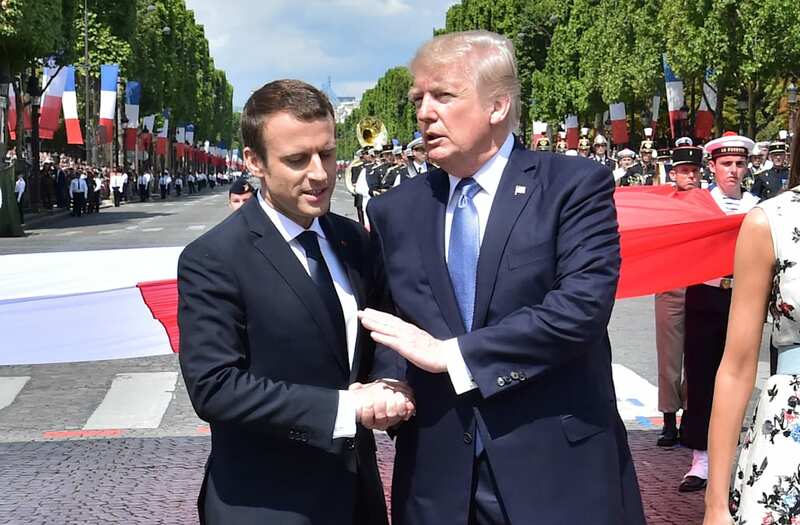 President Trump and French President Emmanuel Macron have engaged in some epic handshakes known for their intensity and extended duration. Trump, in a Wednesday interview with the New York Times, offered a bit of an explanation for them. He said of the French leader, "He's a great guy — smart, strong, loves holding my hand." Trump continued, "People don't realize, he loves holding my hand — that's good!" The relationship between the two appeared to get off to an awkward start, notes CNN. Their late-May meeting in Brussels made headlines for the rather aggressive handshake shared by the two. Neither appeared willing to either loosen their grips or pull away first. Not long after, President Trump announced that he is withdrawing the U.S. from the Paris climate agreement. Nonetheless, Macron extended a gracious invitation for Trump to be his guest at the Bastille Day festivities in Paris. The two attended the parade and afterward shared another uncomfortably long, yet less forceful, handshake. It's estimated to have lasted an astounding 25 seconds.